Bus line 61 will be diverted during the Vivaqua works in the rue Gustave Fuss/Gustave Fussstraat.
! Adapted itinerary direction Montgomery as from 4/2 onwards ! 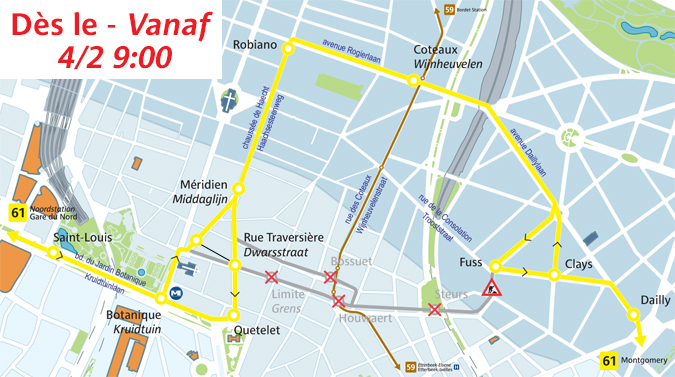 The buses towards Montgomery are diverted between the stops Botanique/Kruidtuin and Fuss via the chaussée de Haecht/Haachtsesteenweg and the avenue Rogier/Rogierlaan. The stops Limite/Grens, Houwaert and Steurs are not operated. The stop Rue Traversière is moved to the chaussée de Haecht/Haachtsesteenweg no. 16. The stop Fuss is moved to the avenue Clays/Clayslaan no. 5. The stops Méridien/Middaglijn, Robiano and Coteaux/Wijnheuvelen of the buses 65 and 66 are operated. The buses towards Gare du Nord/Noordstation are diverted between the stops Clays and Rue Traversière/Dwarsstraat via the avenue Rogier/Rogierlaan and the chaussée de Haecht/Haachtsesteenweg. The stops Fuss, Steurs and Bossuet are not operated. The stops Coteaux/Wijnheuvelen, Robiano and Méridien/Middaglijn of the buses 65 and 66 are operated.